We place great value on the fact you are looking at our website and hope you find what you are looking for. You can be rest assured you are in the right place if you are looking to buy Plantation Shutters. We are a local company who offer an extensive and beautiful collection of made-to-measure affordable shutters, available in different wood types to suit a variety of needs and budgets. A choice of five shutter styles and 117 painted and stained finishes and colours. To view further images of our work and more information about our business please go to our main website, the link is above. Beautifully Shuttered recently provided and fitted plantation shutters to a bay window and to patio doors. They look amazing. Charlie himself measured the windows and helped in deciding what size louvres would be best for each of the sets of shutters. The customer service was great throughout, with suggestions as to what would work best, being kept informed of the expected delivery date from the manufacturer, the job being carried out within the time-frame quoted and the fitters installing the shutters in a professional and workman-like fashion, leaving all tidy. I'm delighted with the finished look of the windows now that they are dressed with these fabulous shutters. Thank you to Charlie and team for our fantastic bedroom shutters. We delighted and so pleased we opted to go with Beautifully Shuttered following a family recommendation and having seen the finished product ourselves. We were not disappointed and they have really finished off our bedroom. Everything we were promised was delivered and more. Thank you. We had our shutters installed last Friday & to say they look beautifully shuttered is an under-statement! The experience, from Charlie coming to measure up & take our order to the installation guy installing them was as smooth & professional as we hoped for. There was no mess, the installation guy worked extremely efficiently & tidied up after him. We are so delighted with them they look amazing. 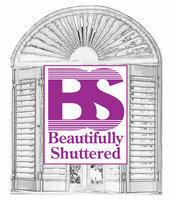 If anyone asks who to buy Shutters from we will certainly say Charlie at Beautifully Shuttered. Definitely the place to go! Well done guys! I can highly recommend Charlie driver and his company. My windows were very challenging to shutter due to the fact that my home is a historic barn with unevenly shaped, non-standard arch windows. It was clear to me from our very first meeting that Charlie wasn't just looking to make a quick sale. He listened carefully to what I was trying to achieve and then he and his team worked very closely with me to design a shutter solution. It was so nice to work directly with the owner of the company instead of a high pressure salesman. The results are nothing short of spectacular. I am thrilled with my shutters and the transformation they have made to my home. I should also mention that Charlie is an absolute delight to work with. He is clearly very passionate about his business and highly focused on providing the best customer experience possible. A friend recommended Beautifully Shuttered when I was looking for shutters for my round bay window last year. Charlie was really helpful and knowledgeable in helping me to decide what would look best in my room. The shutters were expertly fitted and have transformed my room. I am so pleased with the result that I have just ordered some more for my daughter’s bedroom. I would recommend them to anyone! This is the 3rd time we have asked for Charlie to come back to fit more shutters. Great product, great service and we love them. Highly recommend. Fabulous customer service, quality product! We are so thrilled with our shutters. We got a few quotes but I knew immediately that I wanted to get our shutters from Charlie within the first ten minutes of meeting him. It was only when he came out to do our free quote that I realised Charlie talked about and noticed things that the other companies did not with regards to the design of the shutters. He also suggested that I did two different windows initially than the ones I had chosen as then everything would also match from the front of the house.... I had not even thought of this and neither had the other companies. His quote was then very reasonable and either cheaper or in line with the other companies. He gave advice when I asked for it without being a pushy salesman and he was very professional, friendly and approachable. Charlie kept me updated about the arrrival of the shutters and they actually arrived slightly early. They were fitted within 48 hours of them arriving with Charlie and the fitter, Roger, was also superb! The quanlity is amazing, they fit perfectly and Roger tidies everything away and left the room as he had found it - except with beautiful shutters. I highly recommend Beautifully Shuttered and will be continuing to order more for the rest of the house. Do not hesitate to call Charlie to have a chat and get a quote before you order elsewhere. So many lovely comments about them already... they have transformed our room and are worth every penny! We have a slightly awkward window in a loft conversion with irregular window shapes. Beautifully Shuttered transformed the space with perfectly judged shutters, which were designed and installed with great efficiency and courtesy. Charlie and his team absolutely know what they are talking about and are determined to do a great job. Which they do. Just brilliant, in every aspect. Don’t bother going anywhere else, you get what you pay for which is quality and perfectly fitted shutters. Charlie is very knowledgable and made sure the blinds echoed my windows for the perfect look. His fitting team were great, and I was blissfully unaware what magic they were creating, until I stepped in the room and wow, what a transformation, many many thanks.